After weeks of waiting, and the minutes ticking down till the start of the new season this Saturday, the Harriers have announced four new signings to increase our squad to sixteen players. It was beginning to look like we would be turning out against for the opening game against Lewes with just one sub on the bench. The four that have signed today are from amongst the six triallists that have been here for the pre-season games. Martin Brittain, David McDermott and Sam Foley have all been given one year contracts while Martin Riley has been given a shorter one to show his worth. Brittain is the one with the most experience having had a total of five clubs before joining us. He started his career at Newcastle Utd before joining Ipswich Town for one season. During that time he went out on loan to Yeovil on two occasions before joining Carlisle and the Walsall. The wide playing midfielder has impressed during his time on trial with some smartly executed free kicks and corners. 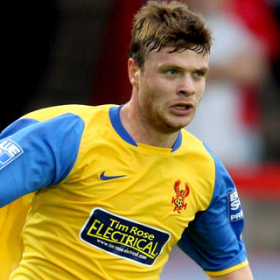 McDermott was released by Walsall last season after turning out nineteen times for them. Upton on Severn born Foley was on Cheltenham's books for two seasons without ever breaking into the first team. He was then sent out on loan to Bath City and responded with two goals in three games for them but even though they wanted him to sign for them he chose the Harriers. Riley is another one that has never played a first team game for his club Wolves. A feat he repeated while on loan at Shrewsbury last season. News about the future of the other two triallists - Michael Bowler and Marco Adaggio - has not been given out by the club yet. Neither has any news about wether Dean Bennett and Simon Russell will be signing a contract for the coming season.